Ald. Khalif J. Rainey giving remarks at the press conference. Photo by Zach Komassa. A new event approved by the Milwaukee Common Council has made its way to the people: Hip Hop Week MKE is now officially underway, with Hip Hop- themed events and performances running this week through Friday, August 26. 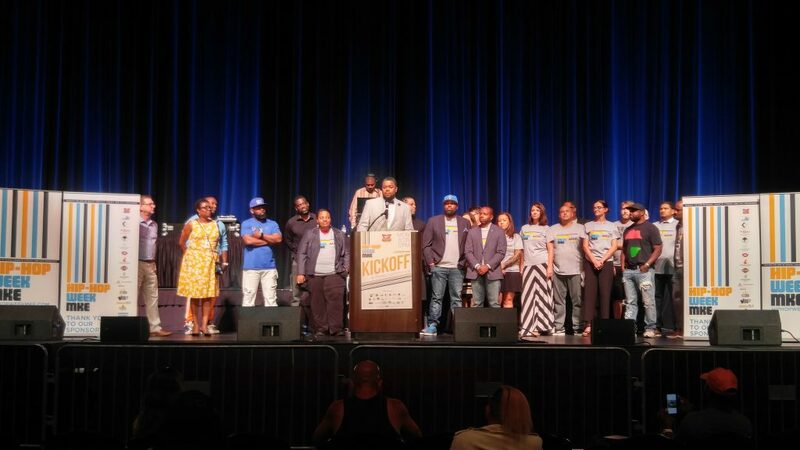 An opening press conference was held at the Miller High Life Theater 1:00 p.m. on Monday, where 7th district Alderman Khalif Rainey introduced and emphasized the significance of this new event, which he has championed. With the help of many local supporters, representatives, and Hip Hop artists, Rainey gave launch to the first city-wide event of its kind. Rainey stressed the importance of this event and its contribution to the well-being of different communities around town. Among other speakers at the press conference was Common Council President Ashanti Hamilton, who showed his support for the cause: “It’s important not just to enjoy the music. We have to understand there is so much to learn from this genre, and the people who made it happen,” he said. Rainey and his supporters stressed this event is more than just a big music festival; it’s a way for the community to learn more about the history and culture of Hip Hop. And a chance to show there are valuable lessons for everybody to learn from Hip Hop culture. The schedule of events throughout the week can be found on the event website. You can show your support for Hip Hop Week MKE — and have some fun — by attending some of the events.